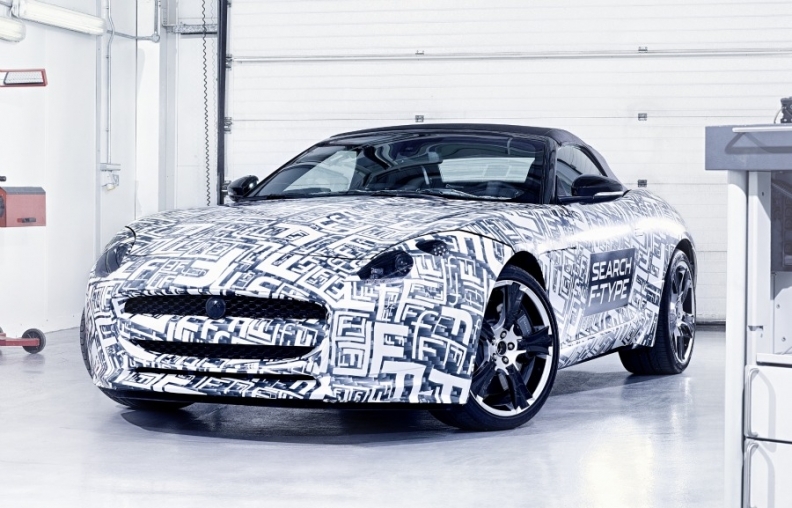 The F-Type, seen here wearing its testing guise, will compete against cars such as the Porsche Boxster and Mercedes SLK. LONDON (Bloomberg) -- Jaguar is invoking its iconic E-Type roadster to challenge Mercedes and Porsche with its first two-seat sports car in almost four decades. The F-Type, due to go on sale in mid 2013, will be Jaguar's smallest car in more than a half-century as the marque seeks a return to its sporting tradition following decades spent focusing on luxury sedans. "If the product can do what the original E-Type did for Jaguar, it will be a huge boost," said Peter Schmidt, managing director of Warwick, England-based Automotive Industry Data. "What they're doing is laudable, it's good for the brand and it's good for the image. But nobody should expect miracles." The E-Type, introduced at the 1961 Geneva auto show, was described by Ferrari founder Enzo Ferrari as "the most beautiful car ever built," and became synonymous with the London of the "Swinging Sixties." Yet it has taken the $2.5 billion purchase of Jaguar by India's Tata Motors in 2008 for a pure-bred sports model to return to favor at the British manufacturer. Tata, which acquired the Jaguar and Land Rover brands from Ford Motor Co. and combined them into a single unit, plans to invest $12 billion over five years to win a bigger part of an upscale market dominated by German automakers. Jaguar says the F-Type, a production version of its C-X16 concept car, first unveiled at the Frankfurt auto show in 2011, is more than just a marketing ploy, and that the model will make money. "We're too small a company for it not to be a viable business proposition," spokesman Angus Fitton said. "It's got to pay for itself and generate profit, but it has got to do a twin job in that it will be a brand-building job as well." Jaguar has yet to say how much the F-Type will cost, though the "speculated price" for the first variant, a convertible, is about 55,000 pounds ($89,000), putting it in a niche where there's little overlap with competitors' models and helping to reduce the average age of Jaguar's customer base, Fitton said. The model will likely compete against the third generation of Porsche's Boxster roadster, which went on sale in Germany last month at 48,300 euros ($62,800), while the Carrera Cabriolet, the cheapest convertible version of the sports car company's 911 model, sells for 100,500 euros. The F-Type will also sit between the Mercedes SLK compact roadster, which costs 38,700 euros, and the brand's new SL, available in Europe from March 31 and priced from 93,500 euros, as well as the 31,500-euro TT Roadster and 123,200-euro R8 Spyder from Audi. BMW's only two-seat convertible is the 36,400-euro Z4. Jaguar's current lineup is based on three models, two of them sedans, with the XJ luxury model positioned to compete with the BMW 7 series and Mercedes S class and the mid-range XF sports model as an alternative to the 5 series and E class from the two German companies. The third model, the XK, is available as a four-seat convertible and coupe and was regarded as the closest thing to an E-Type successor when it was introduced in 1996 to replace the XJS, which itself ousted the 1960s icon in 1975. The 155 mph (250 kph) F-Type will come with a 3-liter supercharged V6 engine tuned to either 335 or 375 horsepower and later with a 5-liter V8, according to Fitton, and will only be produced in a two-seat layout. While that may help restore Jaguar's sporting credentials established with the 100 mph (160kph) SS100 in 1938 and continued by seven victories in the Le Mans 24 hour race with models including the C-Type and D-Type, the F-Type won't deliver the volumes needed for the part-sharing and economies of scale required to compete with larger manufacturers, said Garel Rhys, director of Cardiff University's automotive industry research center. Premium carmaker BMW boosted deliveries 13 percent last year to 1.38 million cars and SUVs, while Audi ranked second with 1.3 million and Mercedes was No. 3 with 1.26 million. Jaguar Land Rover, by contrast, sold 314,433 vehicles in the 12 months ended March 31. While that represented a 29 percent increase from a year earlier, deliveries of Land Rover SUV's accounted for more than 80 percent of total output. "You can't go on like that," Rhys said. "You need that volume, you really do. There has to be much more carry-over between Jaguars and Land Rovers under the skin of the cars." The relatively narrow model range also leaves Jaguar vulnerable to sudden shifts in consumer taste, especially as buyers begin to switch to smaller, more fuel-efficient models, according Andrew Jackson, an analyst at Datamonitor in London. "Because they only have three vehicles, they're somewhat exposed once they get to the end of their life cycle," he said. "The competition could be providing something that might be a bit cheaper, that looks better or might be better fitted." Rhys said Jaguar Land Rover may want to lift deliveries to as many as 650,000 cars a year by 2016 and predicts it will announce a new model in the next six months aimed at competing with BMW's best-selling 3 series in the small- to mid-sized sedan market. "They do need something like that," he said. "Unless you have a vehicle with sales of 150,000 a year, you're really going to be hard-pressed to justify the Jaguar brand long-term."